Writing a recipe for tomatoes and cucumbers is certainly banal. It is simply a dish that even those who can not cook prepare. However last Sunday I decided to make the salad in an unusual way by presenting it as if it were the main course. I also used an aromatic condiment. The effect of the dish and the flavor was very pleasing, so I decided to propose it. This example reminds us that in the kitchen “beautiful” and “good” are always delicious together. In a small bowl prepare the dressing by mixing together the chopped oregano leaves, garlic that has been cut into large pieces, salt and pepper, oil and vinegar. With a fork, whisk the sauce. Cut tomatoes into rather thick wedges. Leave on the peel cucumber and cut into long sticks. Cut tomatoes in half. 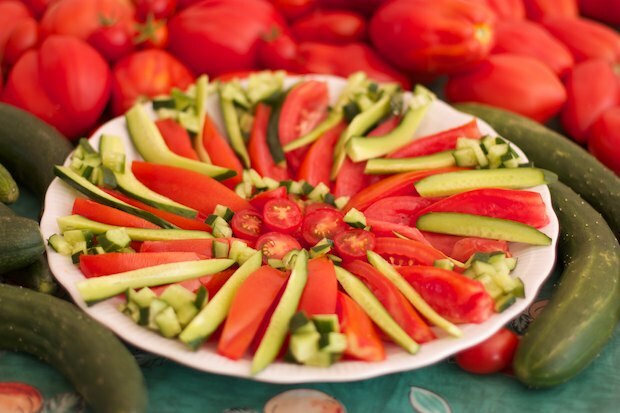 Arrange the vegetables on the plate as if it were a flower centerpeice made out of tomatoes. Evenly pour the sauce with a spoon over the vegetables, bring to the table and let everyone serve themselves.